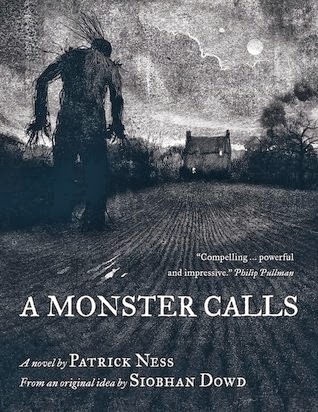 This is the first novel that I have read from Patrick Ness. I borrowed this copy from my library and as I have heard great things about it, I was excited to read it. And read it I did. I thought the general story was fantastic. It was so creative how it was done. It was a fantastic plot twist, and you wouldn't think it was about that. I won't go into it further as I don't want the storyline ruined, but I really enjoyed it. Considering it's designed for children, I was amazed. The cover of the book is incredibly gloomy looking. It gives off a dark vibe, and has the impression that it's going to be a very scary novel. I thought this was a fantastic cover as it hides what's truly inside. When reading the synopsis of the book, I wanted to know why the monster was there and what truth could he be after? It was very intriguing and caught my attention. In this story we have the boy called Conor. He is very brave for not being scared of the monster, however he has other things that he is scared of. Conor is bullied, but sticks up for his mother and I admire him for that. The monster is very persistent and won't leave until he gets what he wants. The other characters in the book are great too. The story is written in second person, which was good as I don't think it would've worked as well if it were in first. There are pictures throughout the book which help you to imagine it in you mind. The chapters are also nice and short. I liked how the monster had tales to tell, so it was like a story in a story. The monster's tales were very insightful and contained hints to Conor. The writing is very easy to understand as it is after all a children's book. I also liked the fact that it was very descriptive but not too complicated. The relevance is good as it is about a monster being called to Conor for a particular reason. The beginning of the story I got introduced to Conor and the monster straight away, and I wanted to know what was going to happen next. The ending was very sad and I felt for Conor, but I also admire him a lot. It was a fantastic ending to a great story. So overall it was a quick enjoyable read and I gave it five stars because of this. Yes. Don't be fooled. Even though it's a children's book, it can be loved from all ages. I hope you have enjoyed reading this review. Another great manga in the series. It's definitely quirky in all ways, but this one had a little twist in it. Omg I enjoyed this just as much as I did with the first. Filled with a few twists here and there and romance and so many funny moments. I need to find out why happens next! I review books in both written & video formats. I also do weekly memes & will talk about books I received. Katie has read 2 books toward her goal of 50 books. Katie has read 8 books toward her goal of 80 books. Katie has read 7 books toward her goal of 75 books. Katie has read 0 books toward her goal of 100 books. Katie has read 0 books toward her goal of 50 books.